Blue Toon boss Jim McInally says he is proud of his players. Blue Toon boss Jim McInally says he is proud of his players and the effort they have put in this season, as they now look certain to secure a play-off place. 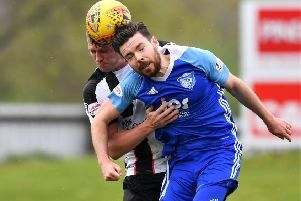 Peterhead stretched their unbeaten run to 19 games - a record-breaking achievement - at the weekend with a narrow 1-0 victory over Airdrie. “It would be great if we could achieve our goal with four or five games left,” said McInally, prior to Saturday’s game. “It’s tough because we are now a target for teams who may expect to lose so they raise their game and come and have a go at you. “If you look ahead at our fixtures for the remainder of the season then we will be facing teams either going for the play-off places or those fighting to remain in League One. “This Saturday it’s Cowdenbeath at the other end of the table so there is something riding on every game and that is the way it should be for us. The play-off matches get under way with the first leg of the semi-finals on Wednesday, May 4 and the second leg on Saturday, May 7. The championship play-off final first leg will be held on Wednesday, May 11, with the second leg on Sunday, May 15. For those who aren’t sure how the play-offs happen, the club occupying position 9 in the Championship will play the club occupying position 4 in League One on a home and away knock-out basis. The club occupying position 2 in League One (currently Peterhead) will play the club occupying position 3 in League One on a home and away knock-out basis. The winners of the ties between the club occupying position 9 in the Championship and the club occupying position 4 in League One andbetween the club occupying position 2 in League One and the club occupying position 3 in League One will play against each other on a home and away knock-out basis in the final tie of the Championship/League One Play-Off Competition. The Club occupying the highest league position at the end of the season will play the second leg of final tie of the Championship/League One Play-Off Competition at home. Meanwhile, it’s your last chance to secure tickets for the Petrofac Training Cup final on Sunday, April 10. Tickets will go on sale at Peterhead FC’s Balmoor Stadium on Friday, March 25, from 6pm to 8pm. Peterhead have been given an initial allocation of 3,600 tickets for the Hampdenshowpiece against Rangers. Blue Toon supporters will be seated in the South Stand. Tickets are priced £20 adult/£10 concession for the lower section of the stand, with £5 for under 16s. Should you wish you tickets to be sent by post/recorded dcelivery, there will be a charge of £2 per order. However, Peterhead Football Club will not be responsible for tickets lost or misplaced in the post. Supporters are encouraged to have tickets distributed by Special Delivery next day for an additonal charge.